Glass and visions of the future go hand in hand. Towering skylines of glass and steel evoke a sense of progress like nothing else. And yet, the technology itself is ancient, and how we work glass is rooted firmly in the past. We’ve automated glassmaking for basic items like bottles or windows, but creating beautiful and complicated glass shapes still requires the human touch and a lot of skill. Machines, however, may soon rival or surpass even artisans. To date, glass and 3D printers haven’t mixed well. But MIT’s Mediated Matter group recently unveiled a custom 3D printer able to make high quality glass products that are transparent to light—a feat other 3D printing techniques have yet to equal. The technique recalls some of the earliest glassmaking methods, when artisans would coil molten glass around a sand core to form shapes. The difference, of course, is that MIT’s printer automates the physical process and liberates the imagination with digital design. Watching the machine work is more than a little enchanting. This isn’t the first 3D printer to print glass. Methods used on materials with high melting points (e.g., metal or ceramics) also work with glass. However, products made in this manner are fragile and opaque. This is where MIT’s printer excels. As described in a recent paper, the printer can print transparent glass with properties akin to conventional glass. The key? It’s all about temperature. 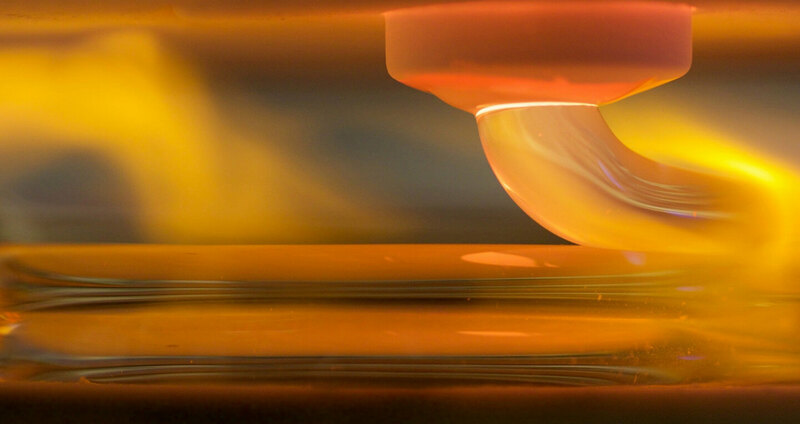 While more conventional techniques fuse glass powder on a print bed, the MIT team figured out how to print with molten glass from start to finish. To achieve this, they split the printer into temperature-controlled sections. At the top, a kiln and crucible are kept at a piping 1800+ degrees fahrenheit. The print space below is kept just above the melting point of glass. A heated nozzle of aluminum oxide allows the glass to travel from crucible to print space without sticking to the sides. Once complete, the final product is slowly cooled to prevent the glass from cracking (this is known as annealing). Like other 3D printers, the process is automated and directed by design software. It currently takes soda lime glass (a common form) but could potentially make other kinds of glass at different temperatures. But as the team further perfects the printer—what might they make? MIT Mediated Matter’s Neri Oxman, one of the paper’s authors, sits at the nexus of engineering, research, and design. We’ve written about her weirdly beautiful 3D printed art in the past. When it comes to glass, she’s imagining an intimate marriage of form and function from small-scale microfluidics to architectural work on grand scales. Starting from digital designs modeled to the finest detail, future architects might skin buildings in glass optimized for various lighting effects, glass that works more seamlessly with the environment, or even glass that transmits data over an entire building’s surface by printing fiber optics into the glass itself. Though such scenarios are still firmly in the future, Oxman says the team is eyeing these larger goals. And as methods for 3D printing diversify and mature, the possibilities at the frontier will only expand.